A jar of blackberry jam was the inspiration for this weeknight Breakfast-for-Dinner meal, put together using staples in my fridge and pantry. Having been given a jar of homemade jam by one of Tom’s co-workers, we were in need of something on which it could be spread! Enter: coupon for a free loaf of bread at Great Harvest Bread Company. Perfect timing! Their bread is very tasty (Parmesan Peppercorn is my favorite kind! ), and I love that you are always offered a bread sample of your choice upon entering the store (and a generous sample at that!). The main downside is that the bread is a little pricy, but it is definitely worth it for a splurge once it a while, since it is so tasty! 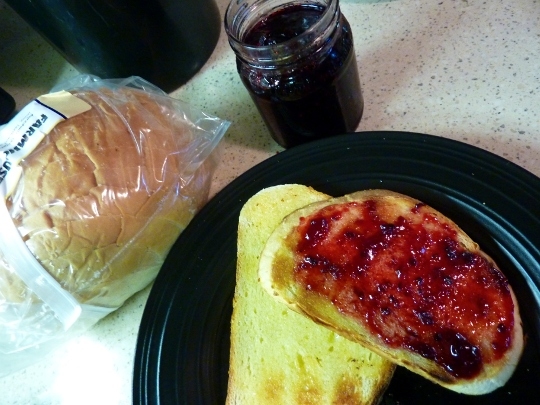 And thus, toasted Great Harvest Bread Company white bread, lightly buttered, and doused in delicious homemade blackberry jam was one part of dinner. 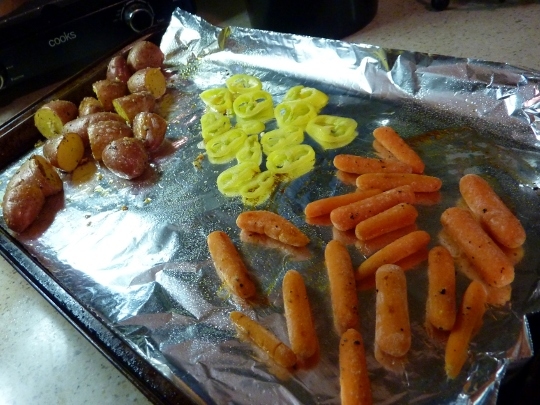 I also roasted up some veggies. Petite red skins with gold flesh, halved, tossed with EVOO, S&P, dried rosemary and thyme, and LOTS of garlic (2 big minced cloves). These were otherworldly! 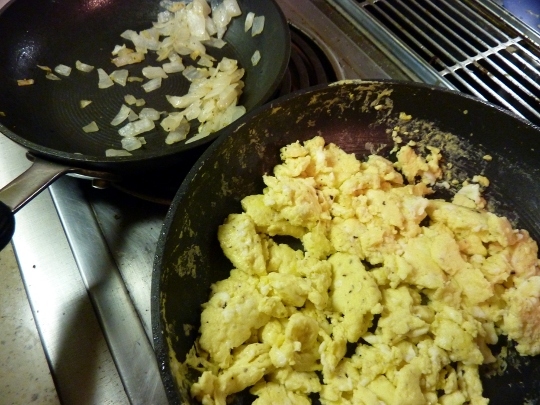 Once I scrambled my eggs slowly over a low heat, they were topped with some luscious, soft sautéed sweet onions. The Plating. 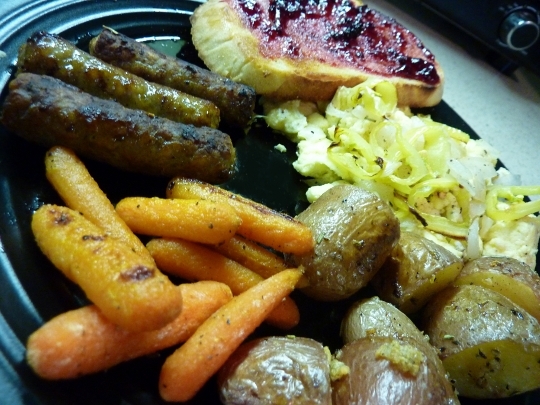 Clockwise: toast with blackberry jam; fluffy spicy scrambled eggs topped with sautéed sweet onions and roasted banana peppers; roasted baby redskins with garlic, rosemary, and thyme, roasted maple baby carrots; a few sausage links dipped in syrup. ♪♫ Currently listening to: Space Dementia – Muse. Looks good ! I still have to try vegs made your way! MOM Have not made breakfast for dinner since you lived here nice change!! !I always liked it and you kids did too!